Bedding: Calcium Sand or walnut shells can be used. Though if the bearded Dragon eats too much of the substrate, it can cause compaction. Take care to monitor the bearded dragon’s eating habits. 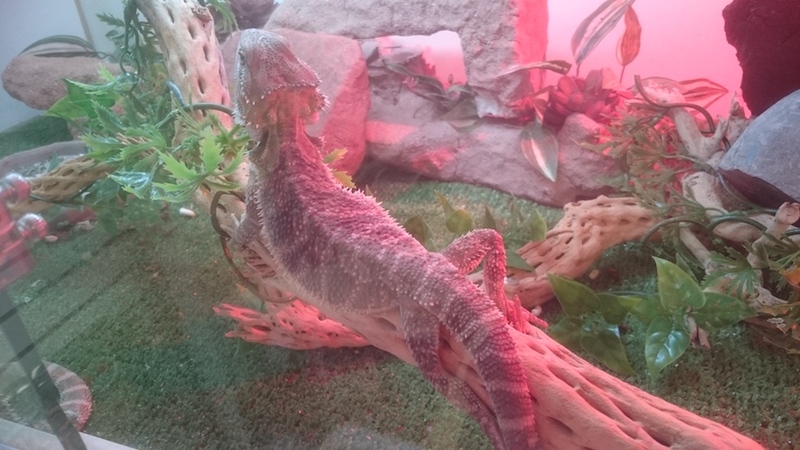 Lighting: Bearded dragons need UVB 10.0 lighting and their daylight hours last as long as 10 to 12 hours. Temperatures: The bearded dragon need a backing area of 100F degrees at one end of the tank and 70F degrees at the other. This can be achieved with the use of heated lighting and ceramic heat ommiters. Diet: Gut Loaded insects with the addition of dark leafy greens and some chopped up fruit. There is also bearded dragon pellets available. Sprinkle its food with a calcium supplement a few times a week. Life Span: 3 to 10 years.